Earlier this month, Bill Grueskin, dean of academic affairs at Columbia Journalism School, wrote a thoughtful argument against the concept of journalists as Swiss Army knives. In his essay for Nieman Journalism Lab, he argued that “one-size-fits-all” journalists trained in a wide variety of digital media skills hurt journalism more than they help it. Asking journalists to do it all, he said, means few of them will do any of it well. Although I’m sympathetic to his argument, and value the fundamentals of journalism as much as anyone, I think he’s fighting a losing battle. As Cohn points out, the multiplex skills and interests journalists need these days are essential to a world in which barriers are breaking down everywhere. Success in journalism is not just a matter of a broad skill set, but also of wide-ranging interests and open, inquisitive attitudes. If you’re involved in training or hiring journalists, Cohn’s article is required reading. You may not like what he says, but, sooner or later, you will have to deal with it. My goal in writing this e-book was to give people trained in traditional media—journalists in particular, but also people from public relations, marketing, and other areas—an easy-to-read, practical, and concise introduction to the new-media revolution. If it’s successful, readers will understand that the ways of new media are not be be feared, but to be welcomed. If you’re skeptical or concerned about new media but want to understand it better, this is a great starting point for you. And if you’re a social-media maven, you may not need this book, but you probably know someone who does. Here are a few reasons why you may want to read or recommend it. It can be read in one sitting. Though it’s short, it provides numerous sources for further reading. To my knowledge, there’s nothing else quite like it (or if there is, please note it in the comments—this is an equal-opportunity blog!). For the moment, at least, it’s very up to date. In coming days, I’ll be reflecting on the process of writing and self-publishing an e-book and why I recommend it. 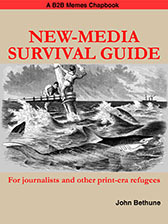 In the meantime, I hope you’ll learn more about the New-Media Survival Guide and let me know what you think of it. In the B2B publisher’s dream world, the transition to online media would come as a natural evolution from print. The vocabulary, the ethos, the culture, the methods would all be organic extensions of print. Reality, of course, is brutally different. The shift to online media is not an extrapolation of the past but a sharp break with it. Until traditional B2B publishers accept and adapt to this reality, they will remain stuck in the past. So far, it seems, they’re still looking backwards, to judge from two recent surveys of magazine personnel. One, from the American Society of Business Press Editors (ASBPE) and the Medill School at Northwestern University, focused on B2B publications. Though the other, from the Columbia Journalism Review (CJR), looked exclusively at consumer magazines, its findings ring true for B2B. The ASBPE/Medill study, announced February 26, found that editors feel unprepared and undertrained for working in new media. Moreover, they think that their publishers lack the vision necessary to succeed online. More than a third of them had no company training at all in the past year, and two-thirds found what training was offered to be inadequate. The CJR survey, released March 1, looked more broadly at the relationship between print and online cultures within magazine brands. 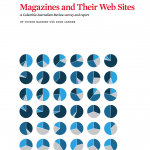 It found that the print side of magazines receives disproportionate attention, with the online side suffering as a result from lower editorial standards, inadequate online experience among staff, and restrictive or poorly defined editorial missions. Not surprisingly for an organization of editors, the ASBPE sees corporate management as the problem, and tends to cast editors as victims. But it might be healthier for editors to share at least some part of the blame. If they sit back and wait to be trained, they are doomed. What training they may be given, if ever, will be limited in scope and quality. Editors need to take responsibility for their own training, and not wait for others to show them the way. The problem, of course, is that for most publishers, the bulk of their money is still coming from print. Since they want to keep the cash cow in the coal mine alive for as long as possible, their goal is a gradual transition to online. And that, of course, is just a strategy for failure. You can’t serve two masters at once; you have to choose one. Moreover, you can’t adopt online media gradually. Trying to do so is really just choosing to keep print as your master. Publishers, start by trying this: Tell your print editors they are online staff first and foremost. And don’t just say it. Act on it. Editors, a word to the wise. Don’t wait around for your company to follow this or similar advice. The lure of the cash cow is simply too strong for them to reorient operations from the substantial but declining revenue flow from print towards the small but growing income from online. Learning your way around blogs, podcasts, online video, and social media is not like taking on vector calculus. Just jump in and start training yourself. The ASBPE and CJR surveys should be a wake-up call to publishers and editors alike. It’s time to change masters.